When you were a child, what film made the strongest impression on you? A few come to mind. When I was 8 or 9, I saw The Bicycle Thief in Fargo. I had seen Roy Rogers movies and the usual fare my friends always wanted to see, and I had no idea who De Sica was or what neorealism was, but seeing a compelling story told almost as a silent movie got me to thinking about more than six-guns and building forts. Then, a few years later, at a movie palace in Minneapolis, I saw Victor Mature standing on a mountaintop in The Robe, and wondered what that vibrating blue-green halo around him was. It’s my first memory of a matte line! Which cinematographers, past or present, do you most admire? ASC members Karl Struss, Gregg Toland, James Wong Howe, Eduardo Serra, Laszlo Kovacs and, of course, Connie Hall. My friend loaned me a Minox when I was in ninth grade. The pictures came out, and I was hooked. Two years later I discovered Henri Cartier-Bresson; then, two years later, as a U.S. Navy photographer at the base library in Japan, I checked out the intellectual tome A Grammar of the Film by Raymond Spottiswoode. Where did you study and/or train? In high school, I had an ultra-nerd (and I mean that lovingly) physics/photography teacher who gave me an incredible foundation in the mechanics, chemistry, optics and general practice of photography. I had found my calling: photography, an art realizable through technology. I also was photo editor of the Los Angeles Examiner’s Scholastic Sports Association, which published my photos of high-school games and track meets. Who were your early teachers or mentors? After serving in the U.S. Navy, I went to the University of Southern California’s School of Cinema. Then I got an uncanny break: Joseph Westheimer, ASC interviewed me based on his impressions of my résumé, which I had deposited at the Department of Employment in Hollywood. Joe’s business was opticals, titles, inserts and photographic effects, and he immediately hired me as his sort of jack-of-all-trades. He was like a father to me, my mentor in cinematography and many other areas. While in his employ, I had the opportunity to assist in shooting inserts with some of our great cinematography ancestors: [ASC members] Hal Mohr, Ernie Haller, James Wong Howe and Lathrop Worth, among others. It was always with a small crew; in fact, most of the time I was it. What are some of your key artistic influences? There have been many. Stieglitz, Bruegel, Cartier-Bresson, Walker Evans, Russell Lee, Vermeer, Orson Welles, Weegee, Willis O’Brien, Bergman, Fellini, Yoshitoshi (a wood-block artist), and Kurosawa come to mind. Japan and Japanese art have been important influences on me. What has been your most satisfying moment on a project? I love movies, and I have been lucky to have so many satisfying moments. An early one: seeing the audience’s excited reaction to my opening shot in Star Wars in 1977. A recent one: working with Mike Nichols on Angels in America. Have you made any memorable blunders? A sunburn that changed my life. While attending the U.S. Navy Photo School in Pensacola, I stupidly fell asleep in the sun on a hot summer day, which resulted in a terrific and painful burn. (In wartime, this would be dereliction of duty, punishable by court martial.) A warrant officer felt sorry for me and allowed me to sit in his office and read advanced photo books while I healed, and we became friends. Later, I found out he was the one who had recommended me for the most coveted and exotic assignment, at the Fleet Air Photo Lab near Tokyo, Japan. Don’t look back: Bob Dylan. What recent books, films or artworks have inspired you? The Shawshank Redemption, Girl With a Pearl Earring and Love Actually. Do you have any favorite genres, or genres that you would like to try? A Japanese historical epic, with battle scenes and all  in English. After all, everyone seems to accept the Gladiator with an Aussie accent! If you weren’t a cinematographer, what might you be doing instead? Photojournalism? Architecture? Writing the great American novel? I don’t think so. I can’t imagine not doing what I’m doing! Which ASC cinematographers recommended you for membership? Joseph Westheimer and Linwood Dunn. 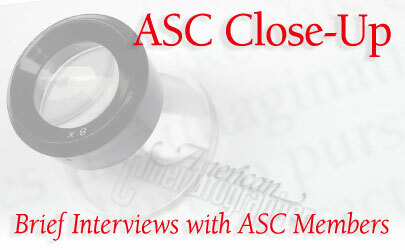 How has ASC membership impacted your life and career? I am often humbled when I come to our hallowed Clubhouse and walk through the same door that so many of my creative heroes have walked through. The ASC is such a distinguished group, made up of those who have long been the creators and protectors of images that have been seared into the memories of worldwide audiences. These images define so many things, from ‘What is it that signifies beauty?’ to ‘What do ghosts look like?’ To become a member of such an illustrious organization is part of what has driven many of our leading cinematographers to excel in their art. We are now at a tipping point in technology; we will move inexorably from photochemical to digital, and it is more important than ever to support the ASC and its aims as we undergo this massive change, which promises to bring incredible new creative opportunities and challenges.